Does Fido need some extra exercise? When you are too busy with work and life, you can always turn to Pawshake to find the best dog walkers near you. Pawshake has thousands of fully verified and trusted dog walkers who truly love what they do. Your dog will never be bored or lonely again! Our dog walking service is a great way for your pooch to stay healthy and happy in a variety of ways. All dogs need mental and physical stimulation every single day. Your dog will maintain a healthy body weight if they go for regular daily walks, which is very important for their long-term overall health. If your dog sits home alone all day with nothing to do, they can become bored, restless and anxious. A dog walk in the fresh air once or twice a day allows your dog to burn some energy, which prevents destructive behaviour at home such as chewing or digging. The many sights and smells on a walk are incredibly interesting for your pooch to take in, and will also help to prevent boredom and stress. Plus, your dog walker can provide plenty of belly rubs along the way! Why is Pawshake dog walking a better choice? Your dog will never be bored or lonely again: contact a Pawshake dog walker to take them out for a walk when you can’t manage. Introduce your dog to the dog walker during an obligation-free meet & greet. Found the best dog walker for your furry friend? Make a booking securely via Pawshake for premium pet insurance, 24/7 online support and our satisfaction guarantee. Pawshake lets you meet and choose the best dog walkers for your pooch. Dog walkers set their own rates and are more affordable than large dog walking companies. Plus, you can specify what you want for the walk, such as dog running, training, or just a leisurely stroll. It’s simple to find a perfect dog walker with the click of a button. 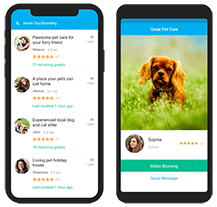 Simply log onto the Pawshake website or mobile app, enter your location and browse local dog walkers who would love to meet you and your pooch. On Pawshake, our dog walkers are trusted and verified locals who have joined us purely because of their love of dogs. During the booking, your dog is protected by our Premium Pet Protection Insurance in case of accident or illness. If you are too busy to take your dog walking, you can bet your family, neighbours and friends are too! Now there’s no need to feel embarrassed asking for help, as Pawshake dog walkers are genuinely there for their love of dogs. The dog walker will update you while you are at work through regular messages and photos. You can also discuss the exact route you’d like the dog walker to take and any other requests, such as a visit to the local dog park or to take your dog running off-leash. Using dog walking for the first time? Have a good look at the dog walker’s profile to see photos of their pets, read about their dog walking service and generally get to know them. You can also read reviews from other happy dog owners, and check the availability for dog walking on their calendar. Arrange an obligation-free meet and greet prior to booking dog walking. This is a chance to introduce your dog, and maybe even let the dog walker take them on a test walk. There’s no need to rush a meet and greet - get to know the dog walker by asking questions and answering any they may have. Meet and greet go well? Return to Pawshake to book the dog walking service - this will ensure your dog is covered by our Premium Pet Insurance and the Pawshake Satisfaction Guarantee. Payment takes place at this point and will be released to the dog walker after the booking has ended.